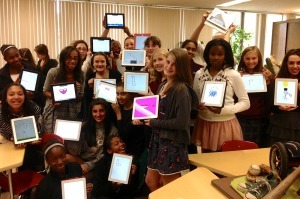 Last week at school, over two school days, I walked into or observed a series of iPad moments. When they happened most did not seem remarkable. Reflecting back on them in total, they make me realize how quickly (and positively) the new iPad has become a pervasive part of our school. * In the faculty work room, a colleague stopped me to enthuse about the Asana application her son had showed her. She thought I would really benefit in my project work, particularly since it operates so well across platforms: iPhone, iPad, OS, PC. * While I was making my rounds an English teacher stopped me to show me that she had started to use Creative Book Builder with her students. * I glanced in the faculty lounge and saw the principal and another staff member reading their iPads over lunch. * As I was about to start teaching my class, a chemistry teacher stopped by my room to show me how she had worked out a kink with her ebook so that both students with laptops and iPads could access resources. * I went to the volleyball match in the evening. I noticed that one of our players on the bench was tracking missed serves and recording hitting percentages with an iPad. * As the volleyball match pushed toward late evening, I saw seated near me sneaking in some homework on her iPad. * I hosted an M-Hub meeting before school and I noticed that one of our juniors had an iPad (only the ninth graders were required to purchase). I asked her how she like it. She said, “look at this”, spun her iPad and showed me her broken screen (Oh, well). * At the morning Curriculum Council I explained how we would do the accounting though the business office for the purchase of apps teachers apps on the fly. * A student stopped me in the hall to show me that a silly picture we had recently posed for was now the wallpaper for her iPad. * I stopped into the art department and chatted with the chairperson about the wonderful Design Foundations course that she has authored. The course detail and resources are so impressive. * As I left the chairperson’s company, I cut through an adjacent art studio space where Design Foundations was being taught. First one student, then a second, and also a third stopped me to show the animations that they had created with Animation Creator. * A reporter from Newsprint (our school paper) interviewed me about our new iMac lab. I explained how this was done in concert with the iPad deployment and the rest of Mercy 2.0. Describing this history made me realize how very much has changed at Mercy in one year’s time. We did not even have an iPad in the building a year ago!